A low-risk business model and an impressive track record make this stock a great long-term investment. Leading net-lease retail real estate investment trust Realty Income (NYSE:O) just declared its 556th consecutive monthly dividend, which translates to more than 46 years of steady income for shareholders. Just as importantly, the dividend has grown steadily over the years, and the stock's performance has shattered the S&P's returns since its 1994 IPO. Here's why Realty Income is the biggest dividend stock in my portfolio and why you should consider it for your own. Realty Income has been an excellent long-term investment for income-seeking investors as well as those who focus on growth. I already mentioned that the stock recently declared its 556th consecutive monthly dividend, and this includes the years before the company's 1994 NYSE listing. In the 22 years since, the dividend has been increased almost every quarter, including the last 76 quarters in a row, by an average annual rate of 4.6%. So, not only does Realty Income pay a generous 3.8% dividend yield, but the company has consistently increased the payment at a rate that has helped shareholders keep up with inflation and more. Even more impressive are the company's total returns. Since real estate makes money in two main ways (rental income and price appreciation), Realty Income has been able to deliver market-beating returns to investors. 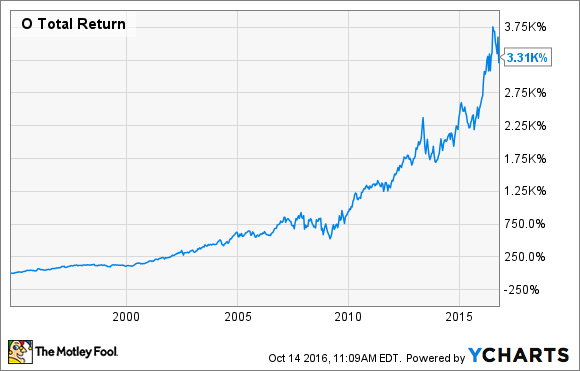 In fact, since the company's public listing 22 years ago, the average annualized total return has been 17.9%. To put this in perspective, an investor who bought $10,000 worth of Realty Income in 1994 would have more than $340,000 today, assuming they reinvested all of the dividends. Many investors have this perception, and to be fair, there are many types of retail I wouldn't think of investing my own savings in. However, Realty Income has narrowed its investment strategy down to three specific types of retail that are risk-resistant, with most of the retail properties in the company's portfolio fit into one or more of these categories. Discount stores. This includes businesses such as dollar stores, which are the fastest-growing type of retail, as well as warehouse clubs. These businesses offer deals that even the biggest online retailers can't match. Non-discretionary retail. These businesses sell things people need, as opposed to things they want. Gas stations are good examples -- not only do people need gasoline for their cars, this is a business that is immune to online competition. Service-based retail businesses such as fitness centers and movie theaters. These tend to be a bit more recession-prone than the other two business types, but since they are businesses people need to physically go to, they don't face any threat from e-commerce. The lease structure is another reason Realty Income is risk-resistant. All of the tenants are on long-term "net" leases, which require them (the tenants) to pay property taxes, building insurance, and to cover maintenance expenses. Not only do these leases minimize turnover with 15-20 year initial terms, they also eliminate most variable expenses of property ownership. It's important to emphasize that low-risk doesn't imply that a stock is risk-free. And no stock that is capable of the type of returns Realty Income has produced is going to be without any volatility. In fact, there have been times when Realty Income dropped significantly, and there will be times like that again. To name one of the company's biggest risk factors, it's likely for the stock to drop if interest rates rise faster than expected. However, with a stock like Realty Income, if you focus on the stock's performance over any given month or year, you're missing the point. Realty Income's business model is designed to generate consistent income without risk over long time periods. In other words, this is the kind of stock you can buy and hold for decades to come, without worrying about your investment.